My wife and I planned a little camping trip this last weekend, but because lakeside camping on short notice tends to result in no camping at all, we settled instead on shacking it up at our favorite Best Western and we let the kids play in the pool. 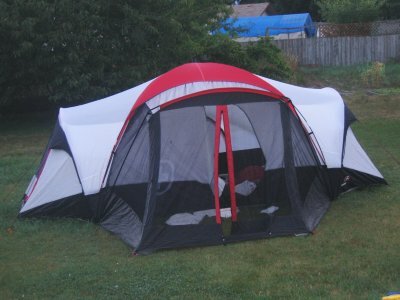 Not to be undone, I decided that when I got home, I'd pitch the tent in the backyard and have a little camping event for the family. The kids slept just fine in their little sleeping bags, and thought it was cold, it was probably the best night's sleep I've gotten in a while. Who says you can't have a fun, inexpensive family event?